Remove any pulp from the preserved lemon; thinly slice the peel. In a large sauce pot over medium-high heat, warm 2 to 3 teaspoons oil until hot but not smoking. Add the broccoli and cook, stirring occasionally, until lightly charred and crisp-tender, 5 to 7 minutes. Reduce the heat to medium, stir in the preserved lemon peel, and cook until fragrant, 1 to 2 minutes. Season to taste with salt and pepper. Transfer to a plate. Wipe out the pot. While the broccoli cooks, prepare the stew. Prep and cook instructions are identical for all fish options. Pat the fish dry with a paper towel; cut the fish into 1½-inch pieces (discarding the trout skin if desired). Season lightly with salt and pepper. In the same pot used for the broccoli, warm 2 to 3 teaspoons oil over medium heat until hot but not smoking. Stir in the anchovy and cook until fragrant, about 1 minute. Add the fish, oregano, tomato sauce base, ¾ cup [1½ cups] water, and as much Marash chile as you like and bring to a boil. Reduce to a simmer and cook, stirring occasionally, until the broth thickens and the fish is opaque and flaky, 4 to 6 minutes for cod or halibut, 3 to 5 minutes for trout. Working in batches if needed, stir in the spinach and cook until just wilted, 1 to 2 minutes. Remove from the heat, season to taste with salt and pepper, and drizzle with 1 tablespoon [2 TBL] oil. Transfer the fish stew to individual bowls and serve the broccoli on the side. Measure the water for the stew. Drizzle the stew with oil. 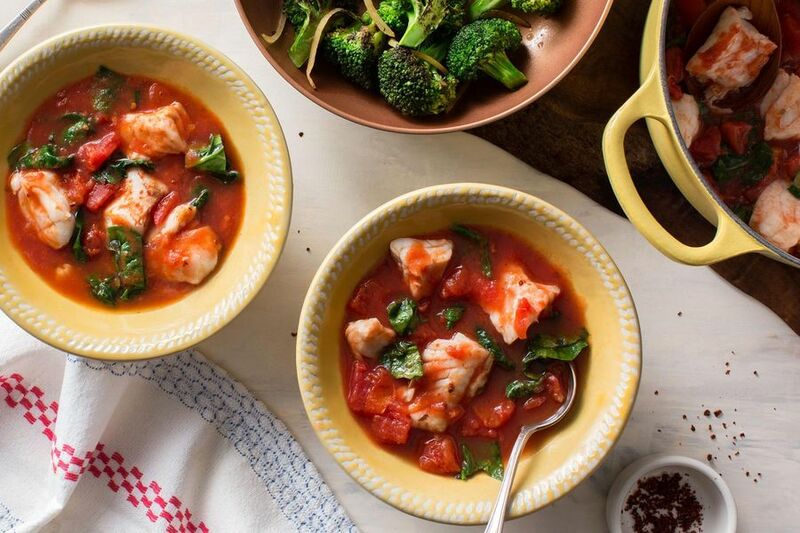 Chef Justine’s ingenious side of charred broccoli florets adds a healthy crunch to pair with this deceptively simple fish stew. Skip the final drizzle of olive oil in Step 3 to shave off 60 calories and 7 grams of fat per serving. Preserved lemons are a signature Moroccan ingredient and deserve a place in your pantry. Packed with salt, lemon juice, and sometimes spices, their peels take on a delicious brininess over a month or so of aging, perfect for perking up braises, salads, and cheese sandwiches. Calories: 380, Protein: 37g (74% DV), Fiber: 6g (24% DV), Total Fat: 17g (26% DV), Monounsaturated Fat: 12g, Polyunsaturated Fat: 2g, Saturated Fat: 2.5g (13% DV), Cholesterol: 80mg (27% DV), Sodium: 550mg (23% DV), Carbohydrates: 21g (7% DV), Total Sugars: 7g, Added Sugars: 0g (0% DV). Sodium does not include pantry salt; for reference, ¼ teaspoon kosher salt added to the recipe averages 240mg per serving, or 10% DV). Not a significant source of trans fat.